Today’s the day – the One Room Challenge reveal. I can’t believe how quickly the last six weeks have flown by. There have been ups and downs along the way, but I’m so excited to share my new Master Bathroom and Walk-in Closet with you. It was a definitely a bigger challenge than the Foyer I designed last fall, but in the end I’m so glad that I selected this space. It’s my now my new favorite place in our home. Serene. Chic. Functional. Love, love, love it. Also to refresh your memory and to appreciate the dramatic transformation, I’ve included a few before images in combination with the new images. I’m over-the-moon with the result. The mosaic marble tile floor was a starting point of the whole design. I went with my gut to do a larger pattern on the floor and I’m so pleased. 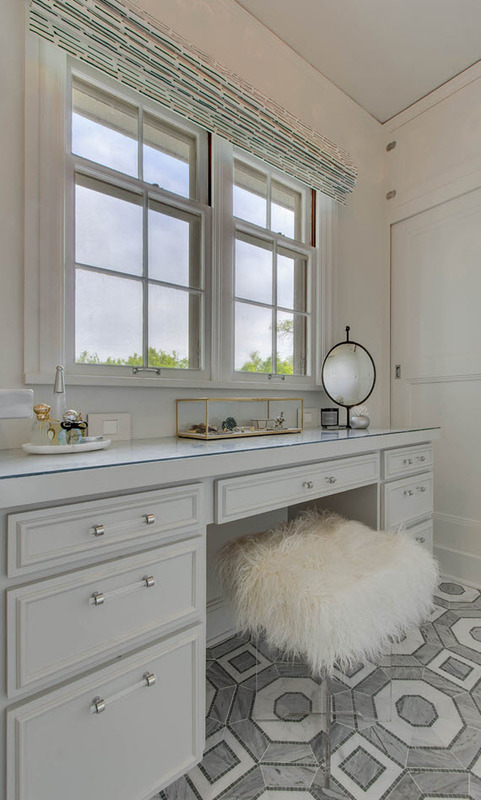 To counter the heavy pattern the walls, the main vanity and trim were all painted in Farrow & Ball’s Strong White. It’s perfect neutral white for all the gray tones throughout the space. I was instantly drawn to Kamala Nahas’ Liquid Amber artwork from minted.com. The black and white photograph of a single leaf was simple, yet striking. I hung it over a double towel rack with personalized towels. I designed the double sink vanity to have modern, clean lines. The polished chrome square ring pulls are a mid-century modern touch that I love. A pair of rectangle under-mount sinks by Kohler (Lowes) are paired with polished chrome faucets and a beautiful Calcutta marble top. 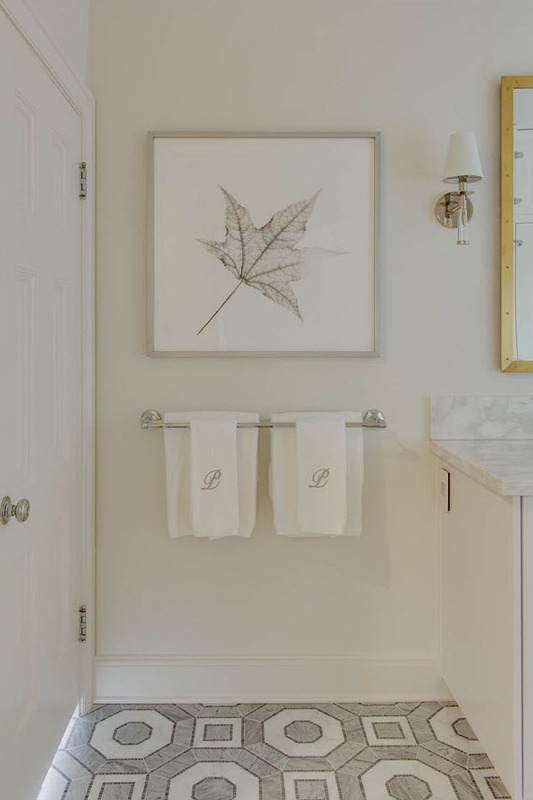 A handsome trio of bath accessories from Waterworks are placed on a black and white boudoir tray. I love the mix of material here! I’m not a fan of matchy matchy finishes. 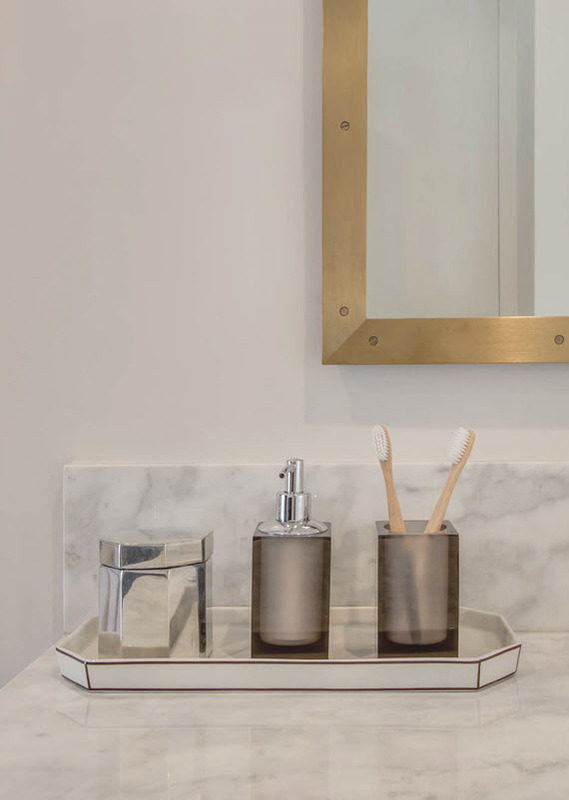 In the bathroom, I mixed a variety of metals including brass and polished chrome. 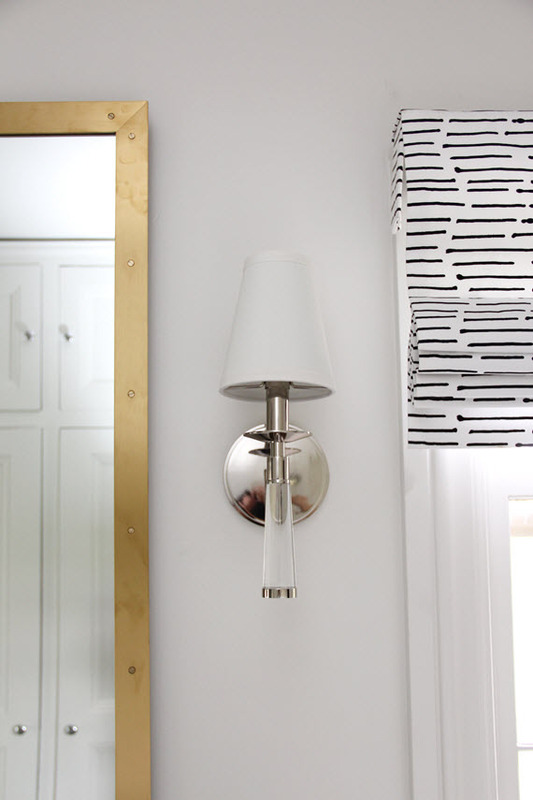 Here is a detail of Crytorama’s glass torch wall sconce flanking the brass vanity mirrors. Loving it! The marble shower features two shower heads, a marble seat and a steam unit by Mr. Steam. 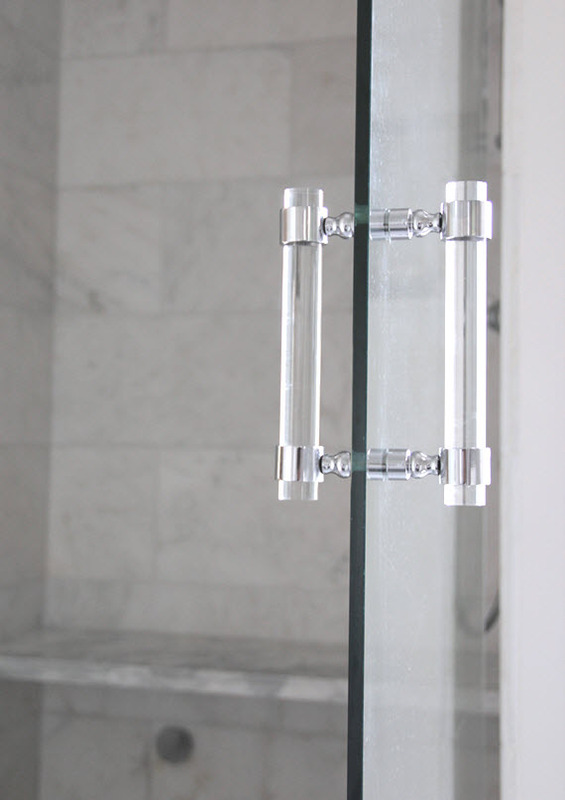 The lucite door handle by LuxHoldUps is my favorite detail. It’s generous in size and adds that chic touch that I was looking for. The water closet is super whimsical. 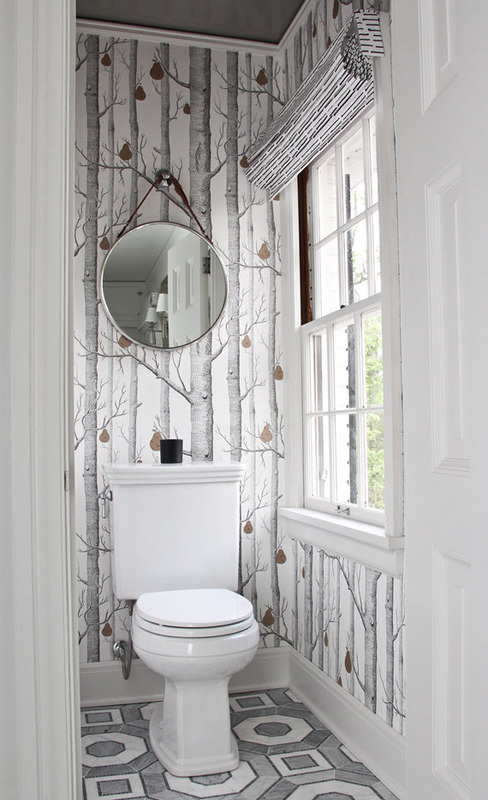 The Woods & Pears wallpaper by Cole & Son (DecoratorsBest) sets a dramatic tone. 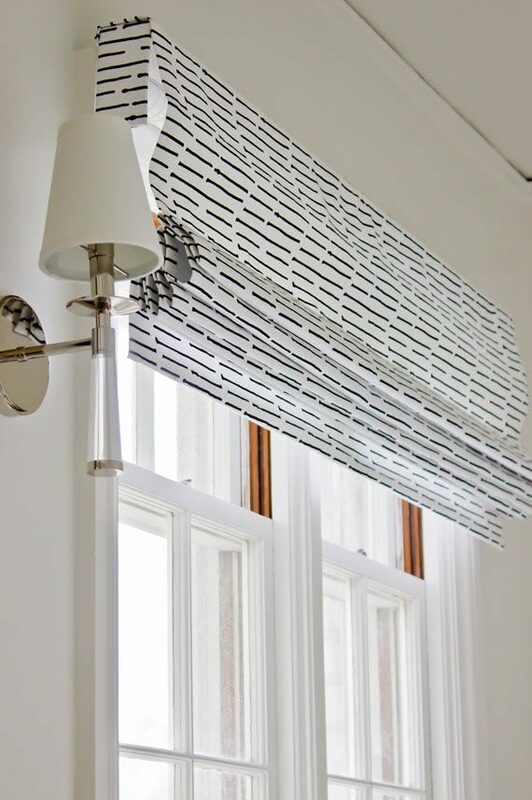 The Roman Shade in Caroline Cecil Textiles‘ Ink Stripe is a fun play on pattern. The round mirror with leather strap (Joss & Main) adds another play on pattern and more natural light to the space. The flush mount ceiling fixture (Crystorama) and painted ceiling in Farrow & Ball’s Worsted is another little element of surprise. 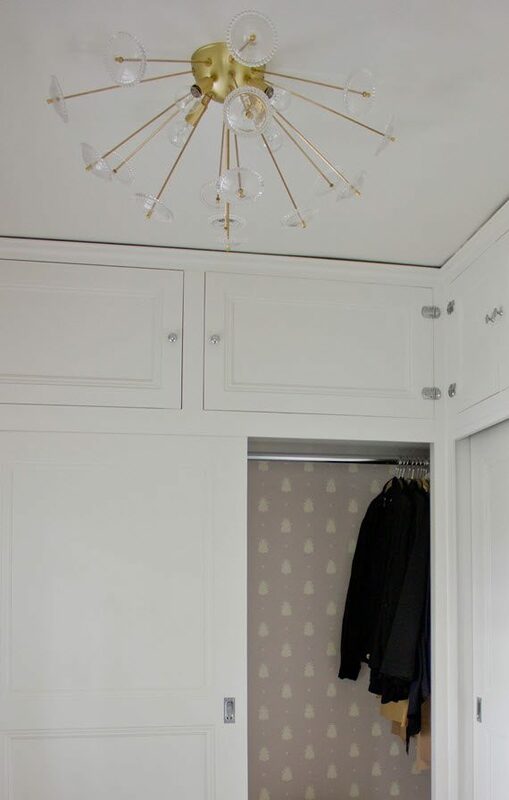 My closets in the bathroom were lined in Farrow & Ball’s Bumblebee Wallpaper 586 – it’s a grayish pink and a nod to the pink in the original bathroom. I had to incorporate a bee motif somewhere! 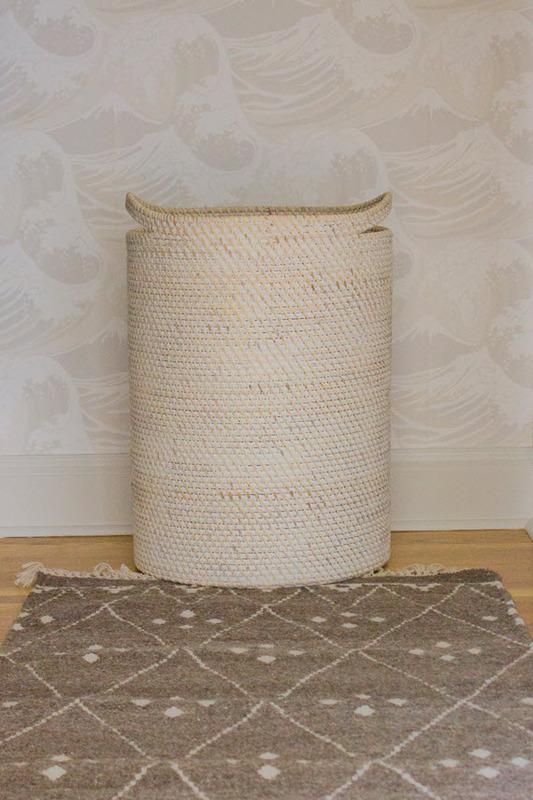 I’m also thrilled with the rolling laundry basket (Joss & Main) and the chic stool (AllModern). For an additional modern touch, I selected a glass & brass sputnik flush mount fixture (Lucent Light Shop) to hang above the make-up vanity. Love it! The make-up vanity is my special little space in the bathroom. Isn’t it pretty? 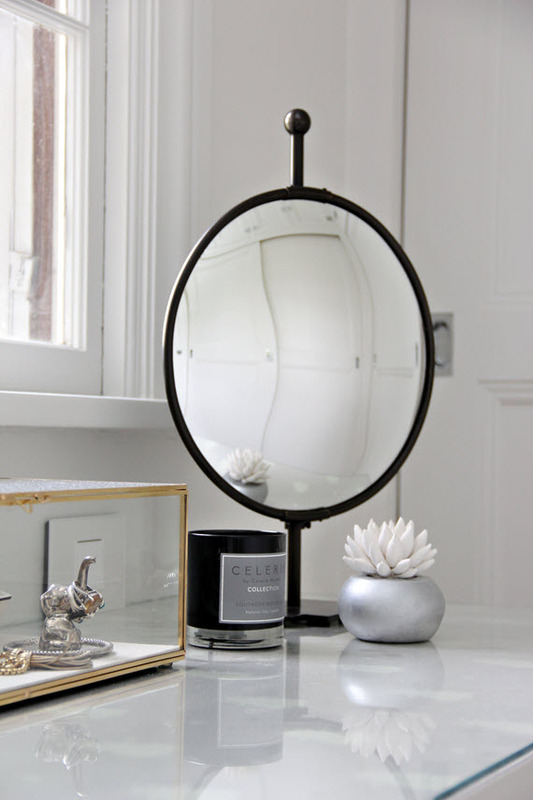 In addition to the stool, I incorporated lots of girly touches like the lucite and polished chrome pulls, round marble tray by waterworks for my perfume and a bronze standing mirror by Arteriors (Bellacor). 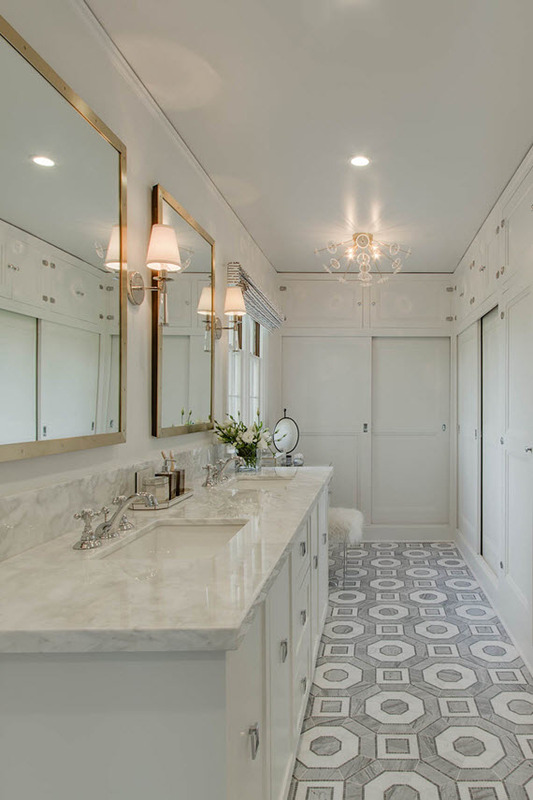 The top of the vanity is also papered in the same Bumblebee wallpaper as the closets and covered with clear glass. The window is also treated with a Roman shade in Caroline Cecil Textiles. 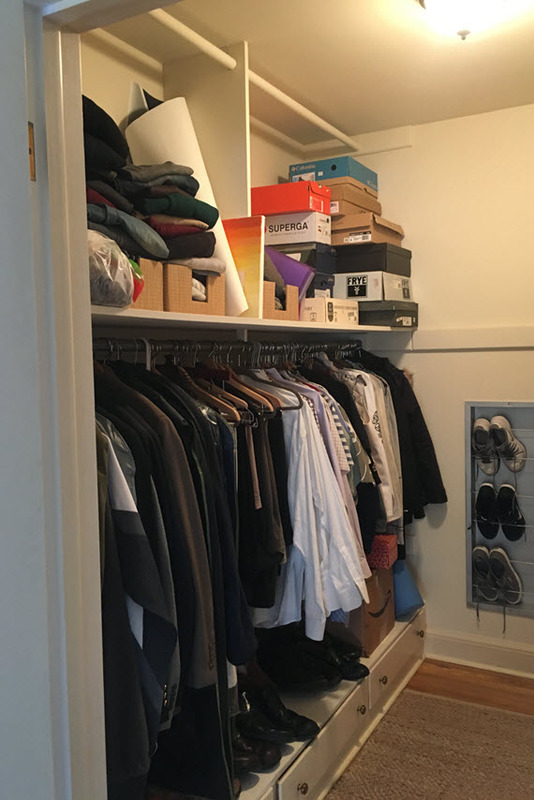 My husband’s walk-in closet was quite a transformation too! The new space features a playful Great Wave wallpaper by Cole & Son (DecoratorsBest), a handsome rope mirror (Bassett Mirror Co) and a stately brass semi-mount light fixture (Crystorama). 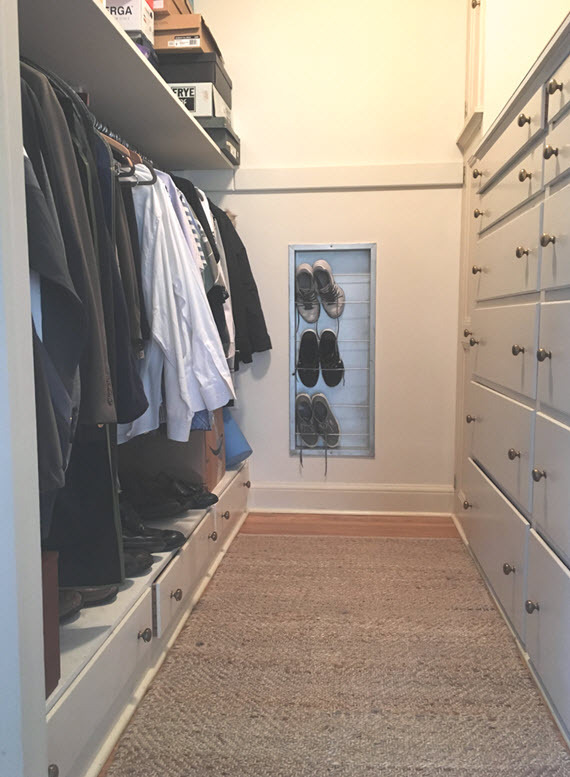 I also incorporated some super stylish storage pieces including a beautiful marble box (Bellacor), rattan laundry basket (Waterworks) and beach house bins that line the shelves. I can’t tell you how relieved I am to have this project completed. The process certainly had its ups and downs. It would have never happened without the support of Linda (the founder of the One Room Challenge), the generosity of my sponsors and all of sub-contractors that maneuvered schedules to make it happen. A huge thank you!!! 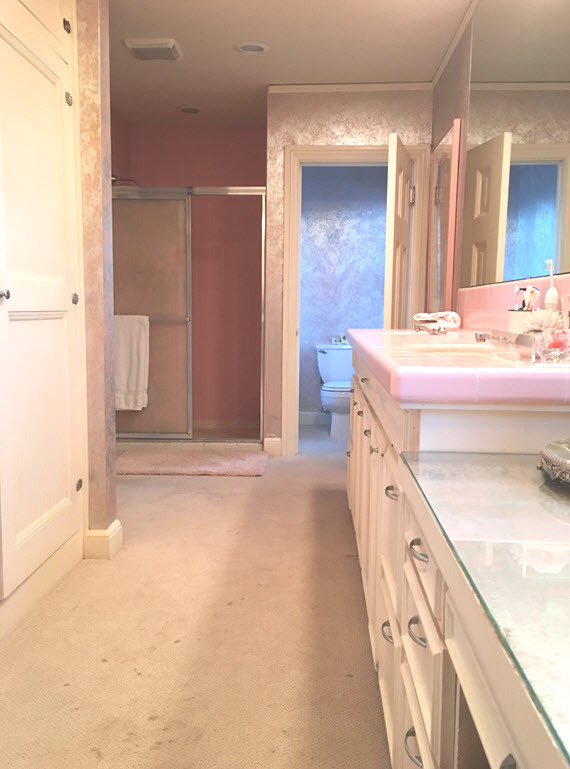 I have to say, the before pictures of this bathroom were very overwhelming! I am so impressed by the reveal and I love how you used the narrrow space! I especially love the tiles on the floor and the tree wallpaper. Fantastic job!! Absolutely stunning! 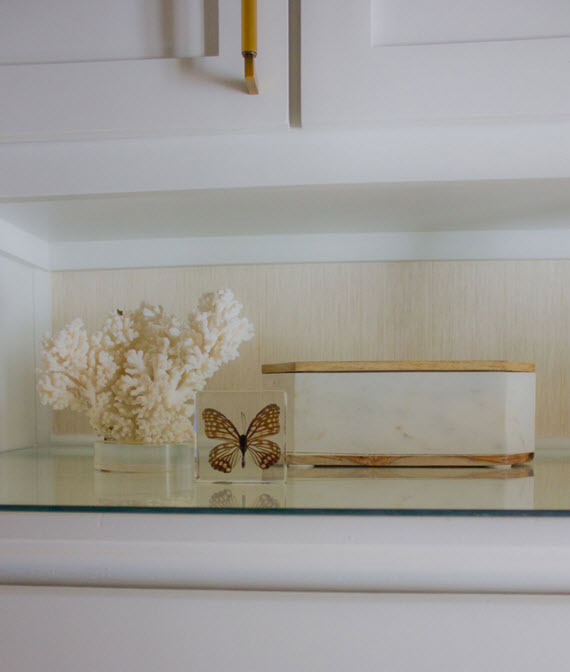 Where did you purchase the counter glass jewelry box? Looks fantastic!!! Congrats to you!!! This is one of the most beautiful bathrooms I’ve ever seen! The colors are perfection. I also love the fact that you kept the footprint. This is the perfect combination of classic and modern. The floor is the show stopper…lookout Mary McDonald. I’m about to tackle a master bathroom that is rather modest in size. Would you mind sharing the dimensions of your shower and the source for the new double vanity? Thank you. Oh and the shower is 4′ x 4′ and vanity is appx 8′ x 24″ – I don’t have the exact dimensions with me! Lovely arrangement and atmosphere of the room! I love it, it’s very neat and tidy. What a stunner of a bathroom! it is amazing and so calming! Wow, it so spa-like and serene! I would never leave this space. Fabulous job! I am so glad you stuck with the larger tile pattern for the bathroom! It truly makes the space. Thanks for sharing!! Wow, Cristin! This space is absolutely stunning! I love everything you selected. The wallpaper, the sputnik lighting, that floor! Jaw dropping good. So happy for you! Enjoy this space!! So hard to believe this is the same room and completed in 6 weeks!!! 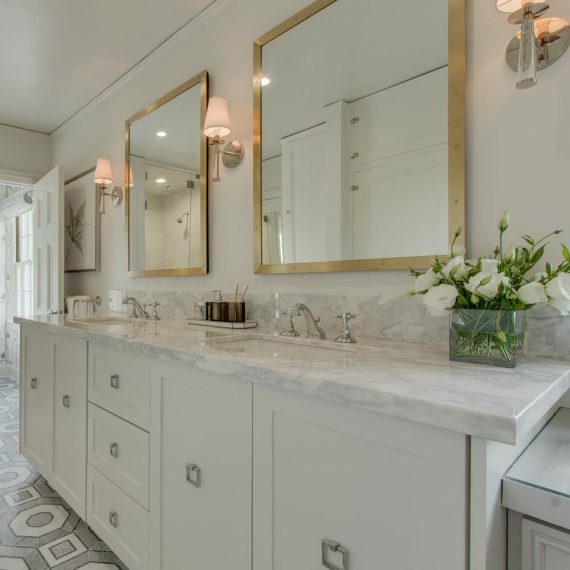 So many gorgeous things to mention from that show stopping tile to the lighting, fixtures and mirrors. And lets just talk about the water closet for a minute….woah!! Seriously such an incredible job! Cristin it’s amazing. I can’t believe it’s the same space. 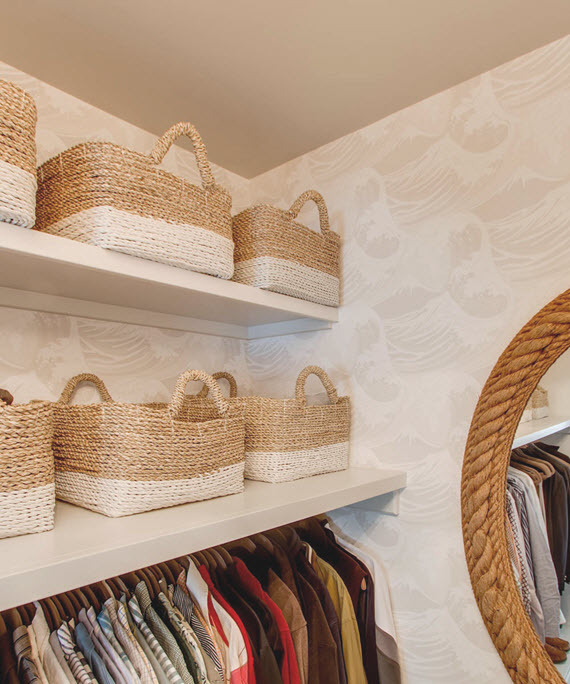 I love how you wallpapered the inside of the closets. They layering of fun and sophistication are spot on. Feels really warm and also fresh and modern. I also love the mixing of metals. Perfect. Wowza-what a stunning space now! Wow, what a transformation! There is so much interesting detail and yet, calming. You know how to create “something beautiful”. Cristin – this is amazing!! 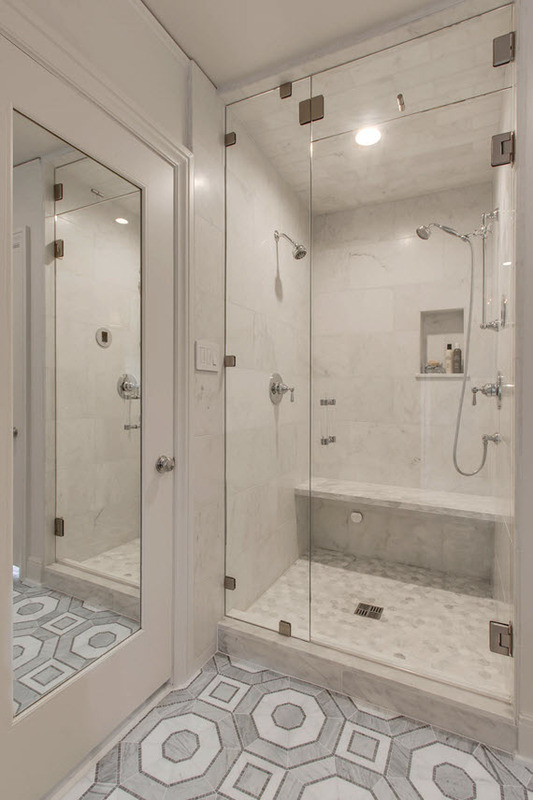 I LOVE that Walker Zanger tile and all of the small finishing details that you put into it. We’re doing a master bathroom addition later this year and this is the BEST inspiration. Cheers on knocking this baby out!! Wow! The most amazing transformation by far!! That floor tile is absolutely stunning and I love how well it pairs with the wallpaper and the roman shade fabrics…and then how the pears in the WC paper pair with the brass mirrors. Every detail was so well thought out. Such a stunning space. All in six weeks. Gah! Fantastic job!! Thank you so much Kate! I love those details too! Stunning. Just stunning. 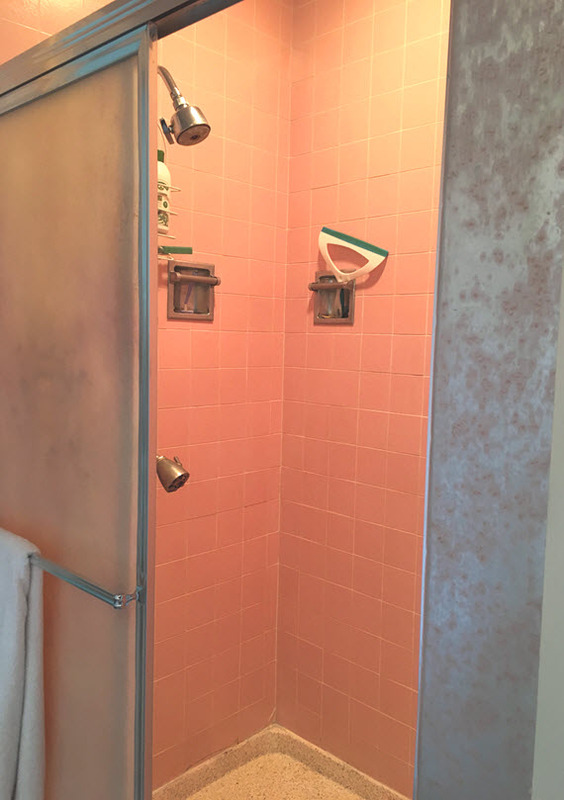 Had to chuckle at the “befores.” Ripped a similar shower door out of our last year, and our other bath is the same shade of pink tile but no weird wallpaper. You certainly nailed it with that floor and, well, everything. Beautiful. A gorgeous transformation of all your spaces Cristin! What an incredible amount of work you accomplished. It feels cohesive and elegant. Congratulations! Absolutely breathtaking! 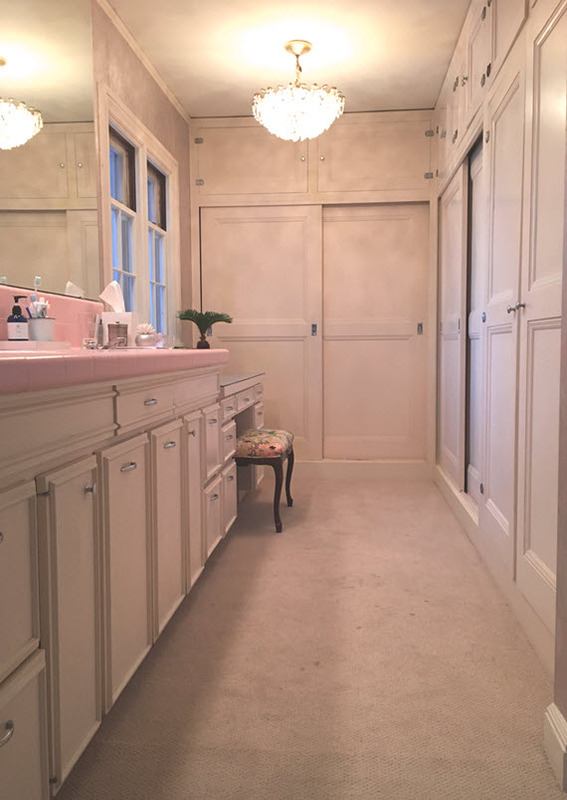 What a transformation into a chic and glam master bath and closet! 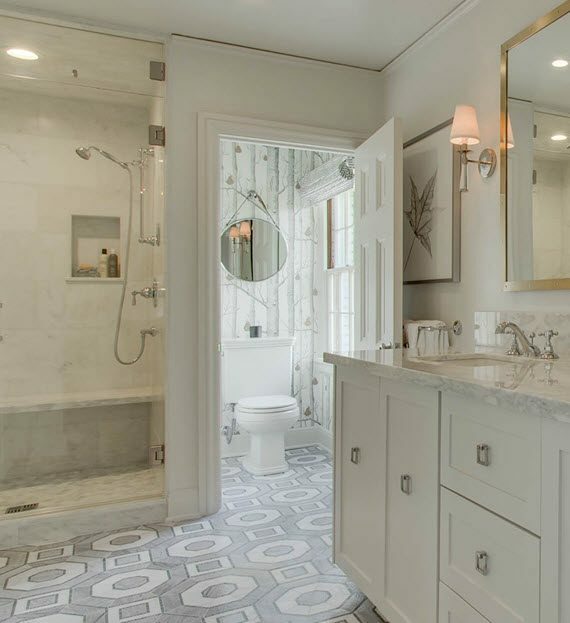 That tile is stunning with the marble and I love the wallpaper and light fixture! Bravo on a job well done! I have been dyin’ to see your space Cristin, and I am totally blown away! WOW! I want everything you chose for my own bathroom! An inspiration for sure! Everything you chose, from the tile to wallpaper is just perfect! This is beautiful! So clean and stylish. I love all of the details. WOW! What a huge undertaking and stunning result! 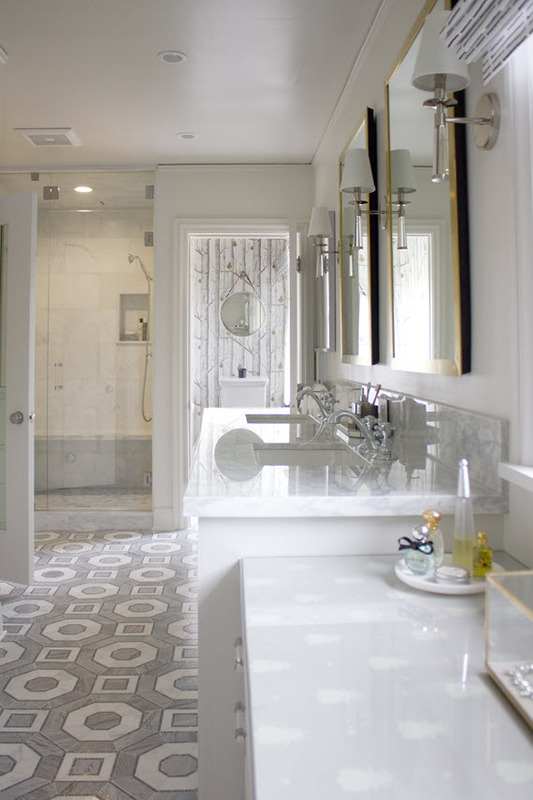 The tile you chose is perfection – I love it. Every detail is just beautiful. Well done! I couldn’t participate this round, and seeing all of these beautiful reveals is going to have me planning for fall! There is nothing like the ORC to get a project done … highly recommend jumping in this fall. WOW! Your new master on-suite space is seriously stunning! Love the details throughout… my favorite is everything 😉 Great space, so glad you are able to enjoy this suite oasis now! Congrats! Wow this is gorgeous… awesome job, and all done in such short time! Wowza! Where to start. That tile is absolutely gorgeous. 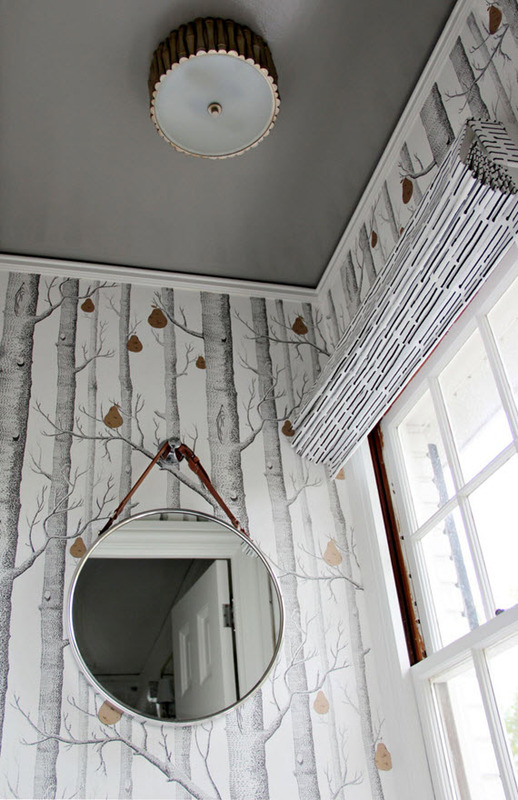 Love the mirrors, the wallpaper, all the details are fantastic. Amazing amazing room! Thanks so much Tiffany! I’m loving all of those items too. Oh. My. Word. This looks so gorgeous and I can’t get over what you started with! 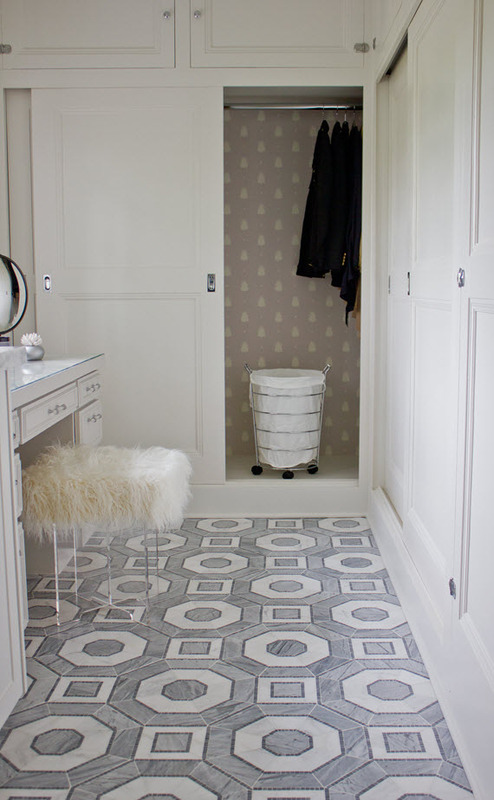 I just love the floor tile you chose, the vanity mirrors, and that insanely good WC wallpaper. Absolutely beautiful. You must be thrilled! I love that little water closet too! What a transformation!!! 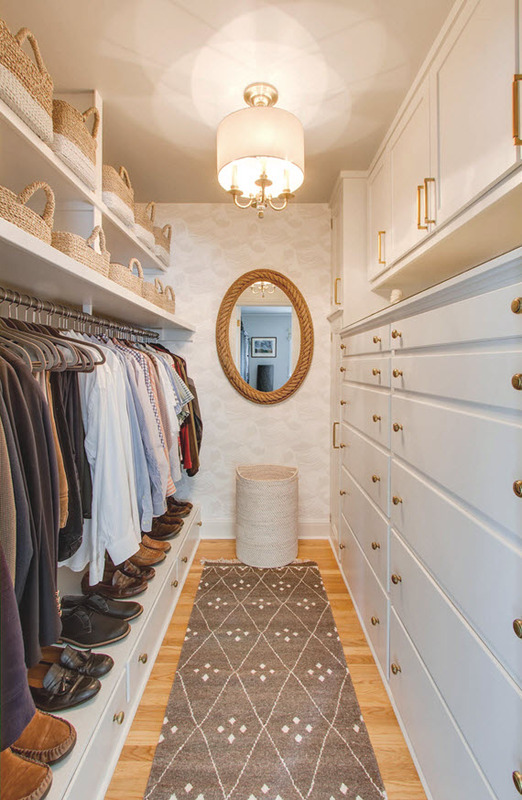 The bathroom looks amazing, and that closet! Dreamy! OMG, what a transformation!!!! This is stunning! The transformation is incredible. Love the feel you’ve created – sophisticated, but still fun, cheerful and approachable. Enjoy using your amazing space! Such a chic & beautiful bathroom! Must make you so happy just to walk in there. That floor tile is amazing and the toilet area beyond chic! I bet you’re now living in these rooms! HOLY WOW! My jaw just hit the floor. I can’t believe you were able to do all of this in 6 weeks- truly amazing. 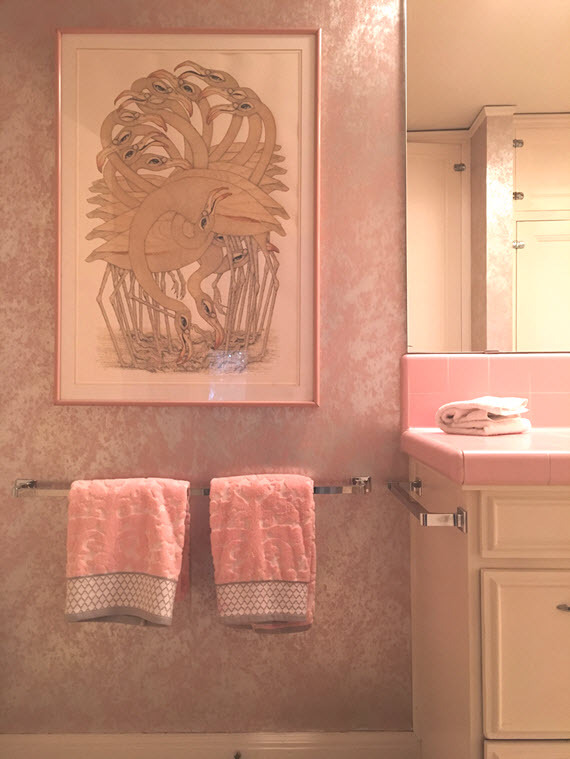 The bathroom is elegance personified and I adore the toilet room…so fun and whimsical but still perfectly paired with the beauty of the main space. And then the closet on top of it…all so so good. Really incredible work!!! Omg this is breathtaking! All the built ins in this space really add to the wow factor! Every single detail is perfection. Beautifully conceived! Congratulations!! Awe, thank you so much Therese! I’m loving the result too.